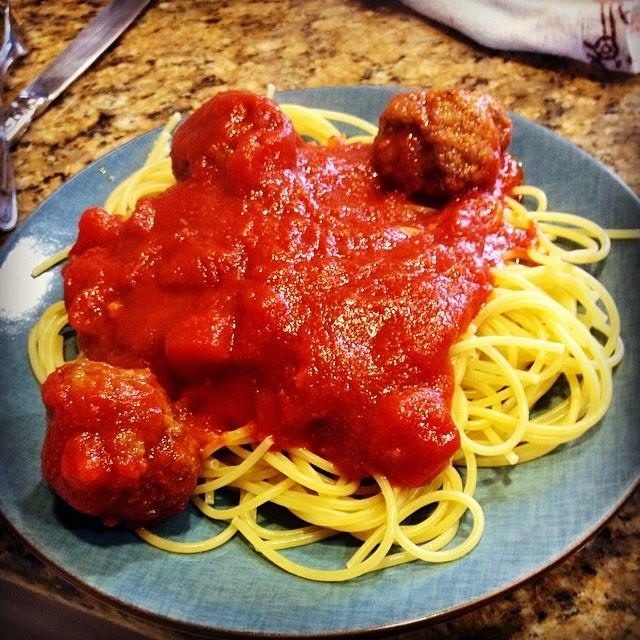 4-Ingredient Homemade Meatballs - San Diego Dining Dish! About once a month, I make up a batch of meatballs to freeze. They're always a hit with my husband, be it in spaghetti (simple, 4-ingredient tomato sauce recipe coming soon! ), meatball subs (generally made from the leftover sauce from spaghetti), or the delicious Tuscan sausage, kale, and potato soup. These are very simple to make, and bake up quickly. They also freeze well, and reheat with a lot of flavor. Without further build-up, here is the recipe! Preheat the oven to 400 degrees. Spray a 9 X 13 pan with olive oil. In a large bowl, combine all ingredients. It is best to do this with your hands, kneading the meats until the spices and crumbs are well blended. Pinch off a 2-inch piece of the mound, and knead it into a ball. Place it into the pan, and continue to do so until mixture has been divided. You should get about 18 medium-sized meatballs. Bake for 15 minutes, or until done. Allow to cool completely before freezing in a freezer-safe container, or throw them in some delicious sauce for an Italian feast!